I’m a non-vegetarian but there are selective vegetarian dishes that I love and gorge on often. One of the things that I sometime find myself craving for is the Veg thali. The fact that you have so many options in one thali to eat is overwhelming and there’s no way that you’ll be disappointed with your meal because there’s bound to be something in your thali that’s exactly how you like your food. So when I heard that the thali expert, Maharaja Bhog opened up in Lower Parel I had to go and try their thali. 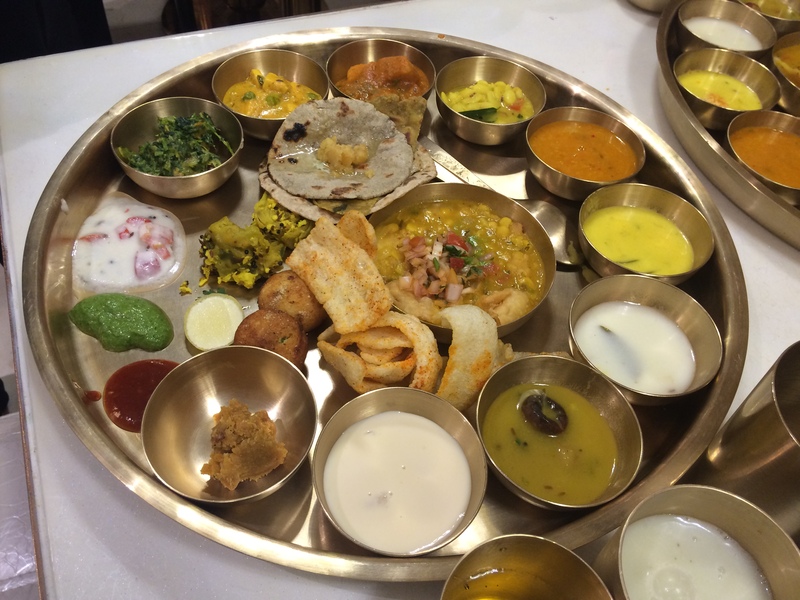 I tried the Family Thali at Maharaja Bhog which usually sits four people but the staff is so helpful at this place that they even agreed to adjust and make more people sit in the same thali which will be as usual overflowing with good food. Another good aspect of Maharaja Bhog is that the patrons here are requested to put a 1 or 2 rupee coin in the charity box (in the form of a piggy bank) which the restaurant gives away to different charities that its supporting. It’s their money and we with our hands donate. The feeling is very good and positive. 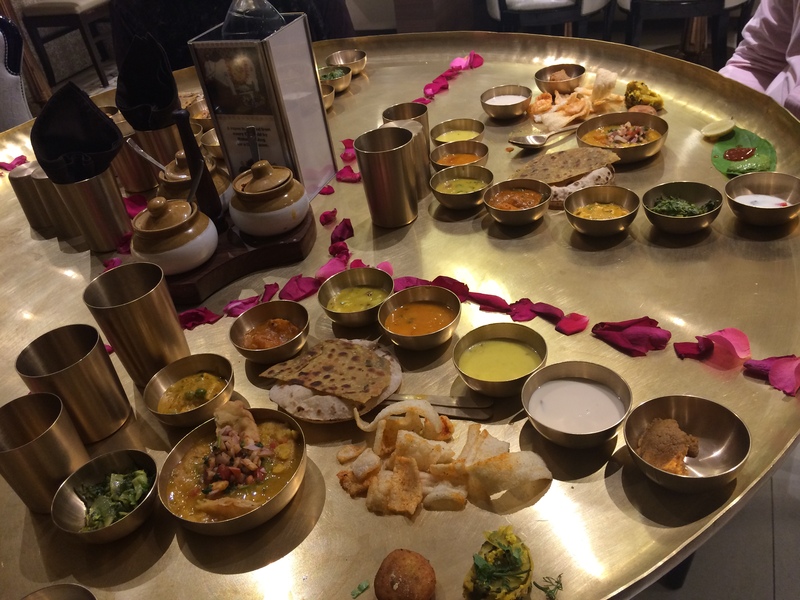 Coming to the eating experience, the staff started the dinner experience with offering to wash our hands in the traditional style by carrying water in a surahi and a large basin. 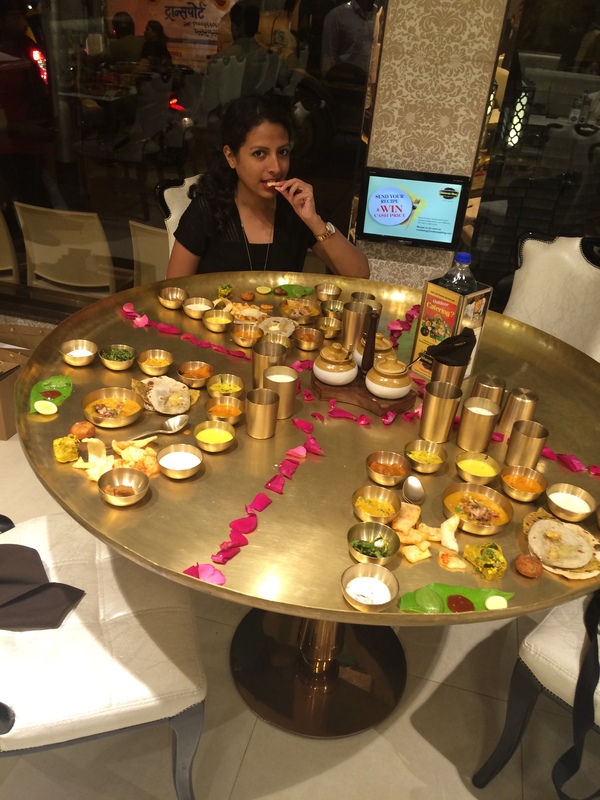 Maharaja Bhog offers 30 different items in a thali and the place has a different menu for all the days in a month! And the thalis are priced reasonably at INR 515 and INR 250 (kids thali). My favourite among all the amazing items were Methi Leela Kanda Muthiya and Sindhi Dal Pakwan Tadka. The way the methi sabzi was made was quite unique and tasted creamy and nice. Maharaja Bhog uses pure ghee for all the food preparation and its taste with Methi lent it a creamy taste which along with the texture of methi made a brilliant combination. Second best item was Sindhi Dal Pakwan which was fresh and tasty. I even liked the way it was served. The server first puts the crispy pakwan in the plate and then tops it with the Dal tadka and then adds diced onion, tomatoes and a dollop of green chutney. And in a very soft tone my server told me, “Ma’am squeeze lemon in it and then eat, it’ll taste better that way”. And he was right. This was the best Dal Pakwan I’ve tasted so far. I’m definitely going back for this! Maharaja Bhog also gives you an option to try their amazing thalis from the comfort of your home or office with their Maharaja Bhog Takeway Mealbox for just INR 220. The best part of the entire experience was the humble attitude and attentive nature of the entire staff at Maharaja Bhog. We were warmly welcomed and attended by the manager all through the meal. Someone was always there to make sure that we are not waiting for anything or if we need anything. There was not one single item in my thali which got over before anyone coming over and offering to serve some more. Maharaja Bhog is excellent at delivering quality food and hospitality. They live their motto of ‘Atithi Devo Bhava’ (Guest is like God). ← FBAI Bar Crawl – To get drunk and wake up fresh!